i hope someone can help me because i am getting mad because of this. the irony is... I was scared about losing the photos of my new born daughter so i decided to copy them on the pc and i used the import function (import and rename photos) ... the photos are all right, after deleting the unused and ugly photos and renaming them all correctly, I went on to the videos and was surprised that I cant see a picture of the video at the file browser (i am using win7) - after installing vlc again and installing klite codec pack and trying out some rendering software I think I am done... I think the videos are lost..
my only hope is that I can do a reformat or something else so VLC can play them finally. In my opinion windows try to rotate the video like it does at photos. This option was marked at the import. Why I say this: The only video, which is shown by VLC, is a video which was made while the phone was hold vertical (like 9 of 10 users do - i hope you know what i mean) - BUT I always make videos with my phone (HTC one) while holding the phone horizontal! so the only video which is working is the video which was made vertical -> after the import I can see left and right of the video black big borders, so the height is correct, but the width not! but VLC is showing it, so I think that the other videos perhaps could be also be shown with VLC, if I could change the weight to height? Can you upload one of the bad ones so I could see how it looks on my PC and try to figure it out? You can give me a link in a private message if you don't want everyone to see. thanks for the help! really, im glad about your offer, but unfortunately i do not know what the video will show. 99% a video of my dautgher, so its better when i do not send you a video. any other information which you can use and what i can offer to solve the problem? i already try some recovery tools on the mobile device and on pc... it just recovered items i do not need. Have you tried playing it with MPC-HC player from the codec pack? yes i try it, same result. it looks like its playing (timeline running, no error) but no video no audio - timeline shows correct timelenght btw. now i uninstalled all codec packs and vlc and reinstall it again, no difference. Disable hardware acceleration in the video decoder to test with pure software decoding. Which phone is it? It is possible the import function did some kind of conversion. Doesn't the phone allow direct access to files? My android phone can act like a USB stick when connected to the PC. Can you record a new test video? Just a few seconds of a wall or anything is fine. I never imported anything to my PC this way, but maybe it was a multiplexer fault that windows used. Maybe you should try recover them by using mkvtoolnix for example. Admin wrote: Disable hardware acceleration in the video decoder to test with pure software decoding. hello and thanks for the advice. I also did this before, but it did not help. Its a HTC phone (htc one m8) - yes it is possible to access the files on the phone, as I wrote, this time (never did this before) I used the import function of Windows, so that the photos can be imported into automatically named directories - I clicked on the mark "delete after import" - as I said this was big fault, till now I always double check before deletion. unfortunately it is not like a "USB mass drive" - its only possible to acces the phone as a "device" - I already try to enter the developer mode on the phone to enable usb debugging, so that i can enter the phone as a disc (so it has a letter), but its not possible to do this. Mangusta833 wrote: I never imported anything to my PC this way, but maybe it was a multiplexer fault that windows used. Maybe you should try recover them by using mkvtoolnix for example. ok i try it again and I could get the same error, before import i copied the file so i the working file and the corrupted file after import. i can upload it. Here? Trouble wrote: i can upload it. Here? I don't see any option to upload it here, but recently I have discovered this site: https://expirebox.com/. The good news is that the video data is intact. 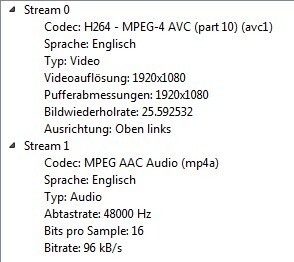 The import injected some extra metadata in the file header that breaks playback. You could use a hex-editor to "undo" those changes. Hopefully it is similar for all files. I have yet to find a better method of fixing this. oh great news, thank you! ok i try this and it works for the one file i upload, but the other corrupted files have not the same changes. If I look at the sample you uploaded, then the first two differences are both size indicators for (parts of) the header. The extra blob of data is 132 bytes (84 in hex). That matches exactly with the size differences: 86 - 84 = 02 and A8 - 84 = 24. The data is the extra block is a date (of import), which should be same of all your files in the original set. thanks. so when i cut off the extra block, which is included at the import, the size indicators should bei 02 and 24, right? in other words: is it ok, when i copy the same header to all video files? because thats not working. No, you should subtract 132 (which is 84 in hex) from the two size values. Those values might differ between files. OK, I understand, Thank you! 6E minus 84 = 110 minus 132 = -22 (this should not be possible I guess) - what am I doing wrong? In that case use a four character value. It is still weird that the import is breaking the files. I would expect more people with similar issues. Or are you perhaps using a potentially buggy Windows 10 insider build? Hi again, i am using win7 - always doing all updates - nothing special at my configuration. But yes, its weird... perhaps its a combination of the mobile device (HTC) with a SD-Card and Win7 which results in this failure? But in future I am not going to use the import function anymore. It is just a good feature to let the pic rotate automatically at the import, so I do not have to do this manually. I am also using a renamer for the files so I also do not need a directory to be created by the import function itself. I would also prefer to do this at the command prompt but at the windows command line its perhaps too complicated? Perhaps I should turn on the linux machine and write a script there? Any other suggestions so I do not have to do this manually?